Challenge Laguna Phuket’s Tri-Fest carnival, which will see thousands of international athletes from around the world descend on the island for the legendary Laguna Phuket Triathlon (LPT) on 22 November celebrating its 22nd birthday this year by welcoming back the returning Challenge Laguna Phuket a week later on 29 November, was previewed today (Thursday 29 October) for media by organisers and sponsors in a special conference at Banyan Tree Hotel in Bangkok. 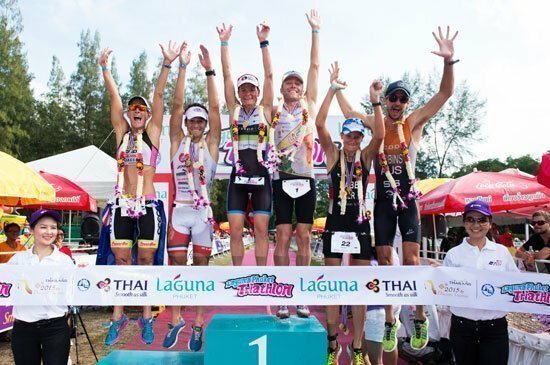 The multi-media event showcased some of the elite triathlon stars set to compete in both races and thrill spectators who each year throng to see the action in the spectacular swim, bike and run courses in and around Laguna Phuket. This year’s Challenge Laguna Phuket field is headed by Ruedi Wild (SUI), Massimo Cigana (ITA), Alberto Casadei (ITA), Luke McKenzie (AUS), Melissa Hauschildt (AUS) and Radka Vodickova (CZE) to name a few. Both Wild and Hauschildt are defending their titles from last year’s Challenge Laguna Phuket Race while Cigana and Casadei are back to defend their jointly-won Laguna Phuket Triathlon title. Laguna Phuket Triathlon and Challenge Laguna Phuket are linked by a Tri-Fest of training and social activities at Laguna Phuket during the week between the two races. Sport Spot Thailand (TYR) and Event Director Prapa Hemmin representing Laguna Phuket. 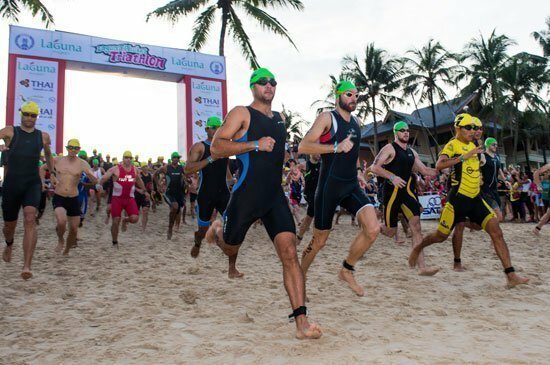 With thousands of athletes, each with 3-5 followers; family members, friends, partners, media, sponsors and/or supporters traveling together to Phuket from around the world and spending 4-5 nights during the weeklong Tri-Fest, the event is projected to generate over 93 million bath spending in tourism segment on the island. Like every year, athletes booking their slots in the Tri-Fest are being asked to raise funds through donations and sponsorships for the resort’s long established “Laguna Phuket Foundation” to operate its various charitable programmes. Over the years, millions of Baht was raised to fund such initiatives as local school renovation, survival swim, Community Learning Centre, Seedlings Phuket and the mobile learning centre.